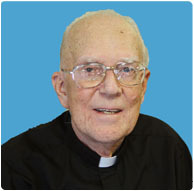 Redemptorist Father Arthur Mahoney, a missionary, military chaplain, rector, and mission preacher, died Saturday, July 17, St. John Neumann Residence at Stella Maris in Timonium, MD. He was 86 years old and suffering the advance of Alzheimer’s Disease. A Bostonian by birth, Father Mahoney was the son of Arthur and Josephine Murphy Mahoney. He was born Aug. 6, 1923, and grew up in St. Margaret Parish in Dorchester. He completed three years at Boston College High School before entering the Redemptorist juvenate, St. Mary’s Seminary in North East, PA. He spent his novitiate year at Ilchester, MD, and made his first profession of vows in 1946. Going on to higher studies at Mount St. Alphonsus in Esopus, NY, he made his final profession in 1949 and was ordained to the priesthood on June 17, 1951. One of his classmates, Father Lawrence Lover, recalled that his confrere “was a great singer, a tenor, and he sang with our choirs both at North East and at Esopus.” Father Mahoney’s first love, though, was for mission preaching, although it “took him a long time to get there,” Father Lover added. Father Mahoney’s first three priestly assignments were to the U.S. Virgin Islands: at Holy Cross Church in Christiansted, St. Croix, in 1953; at Sts. Peter and Paul Church (now a cathedral) in Charlotte Amalie, St. Thomas, in 1954; and back at Holy Cross in 1960. After 13 years in the tropics, Father Mahoney was assigned to St. Michael Church in Baltimore. He was there for only a year when an urgent call for Catholic chaplains to minister to the military troops in Viet Nam led to his volunteering for such service. “He was a Yankee Doodle Dandy patriot,” said his confrere Father John Kelly. “He even had red, white and blue suspenders.” Father Kelly noted that Viet Nam veterans served as pall bearers at his friend’s funeral. In 1968, Father Mahoney wrote from Viet Nam: “Presently I work in and out of the main base camp of the 4th Infantry Division. We are located 30 miles from the Cambodian border, just south of the town of Pleiku. A rather fair number of the Vietnamese in this area are Catholic, many fled from the north.” He mentioned that he was celebrating four Masses at the base each Sunday and that throughout the week he would celebrate Mass at various places, sometimes going by helicopter to forward fire bases. In the course of his service there, he was awarded two bronze medals, according to Father Kelly. On Father Mahoney’s return from overseas, he was based at Fort Meade in Maryland and often visited Father Lover, who was rector at the nearby novitiate in Ilchester. After completing his military service, Father Mahoney was assigned, pro tem, to St. Alphonsus Church in New York City in 1971 and then to San Alfonso Retreat House in West End, NJ, the following year. He went to Sacred Heart of Jesus Church in Baltimore, serving as rector from 1972 to 1978, when he became rector of St. Christopher Church on Kent Island, MD. In 1984 he was appointed rector of St. Gerard Church in Lima, OH. After Father Mahoney’s three-year term in Lima, which included not only a large parish and school, but ministry at a State Penitentiary, the priest began his traveling missionary days. Father Lover recalled that even as far back as North East, his classmate took courses to train his singing voice for preaching and became an active member of the public speaking group. Finally, in 1987, he was appointed to serve with the Missionary Band, that group of Redemptorists who travel no matter what the weather and live out of their suitcases for the purpose of preaching at far-flung parishes to regenerate and renew the faith of the people. Often with Father Kelly, often with Father John Devin, Father Mahoney would preach from Maine to Florida. During those years he was stationed briefly at St. Wenceslaus Church in Baltimore and then at St. Philomena Church in Pittsburgh. He was assigned to St. Clement Mission House in Ephrata, PA, in 1993 and to St. Mary’s Church in Annapolis in 2001. “We feel that the Mission did a great deal of good and that it is the type of Mission that is badly needed in our modern world and Church. Many of our people went out of their way to thank us for having the Mission and tell us how much they derived from it. Father Mahoney, whose mother died when he was very young, is survived by his younger half-sister, Mrs. Mary Egan of Sherborn, MA. Vigil service at 7 p.m.